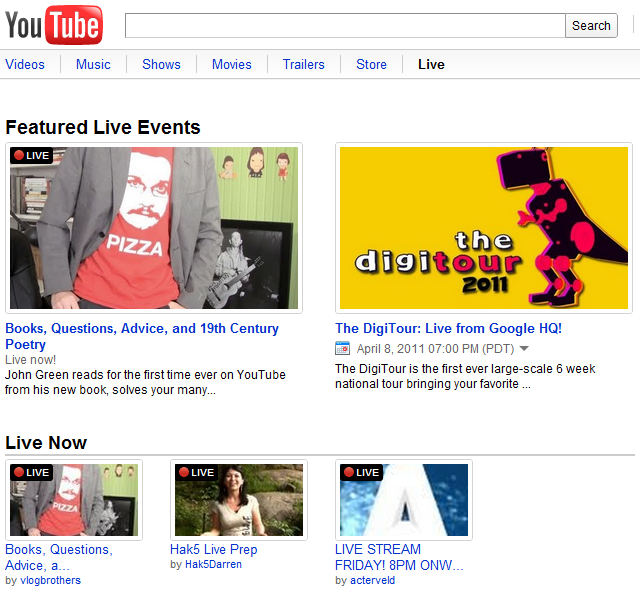 The evolution of YouTube continues, and today the site introduced a live video feature. According to the site’s blog, the beta version of YouTube Live will be gradually introduced, but the end goal is to allow its many partners to steam live content from their channels. YouTube has increasingly become a portal for live or breaking news and events, and the site claims users want more of these “events taking place right now.” You can check out Youtube.com/live now to get an inkling of what the final product will look like. It’s pretty straightforward: The page shows you what live programming is coming up today, tomorrow, and next week and at what time. For the time being, there isn’t much (if any, depending on your definition) mainstream content, but that should soon change. Earlier this week, a report from the Wall Street Journal said that Google is putting YouTube through some major revisions – revisions that will potentially cost $100 million and introduce channels and professional-grade productions to the site. Rumors about YouTube’s transition from home video forum to competitive TV streaming site have been circulating for awhile now, but this is one of the first steps that has been publicly revealed. While its announcement makes no mention of the celebrity channels possibly in the works or the production studios Google is taking meetings with, YouTube Live is ideally setting the stage for the introduction of channels and professional content. This step could hugely benefit Google as it continues to market Google TV: If YouTube Live can serve as a platform for popular programming, it would give its Internet TV platform some stronger legs to stand on. Of course, that’s provided Google can recruit what its viewers want. Another potential benefit is that YouTube Live would seamlessly package social into live streaming. Sure, the jury is still out on how much of a social element people want integrated into their TV time, but research is strongly suggesting that certain products are going to succeed here. YouTube Live will let users login to interact with fellow streamers. Aside from the lucrative business opportunity, Google likely sees this as are some larger implications. YouTube has become an important outlet for international happenings that otherwise would largely go unseen. Live streaming events like the Middle East’s Facebook Revolutions could make it a go-to source for global news coverage. For the time being, your YouTube live stream options are limited – but be sure, this is just the beginning of Google’s programming ambitions.